It’s funny how I sometimes start doing something that gets me somewhere totally different. 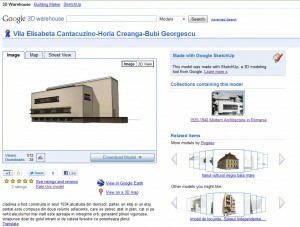 I was looking for online reference for a project – I plan to model a building from Bucharest from the 30’s – and was expecting to find scans from architectural school books when google brought up a 3d warehouse model of that building, . 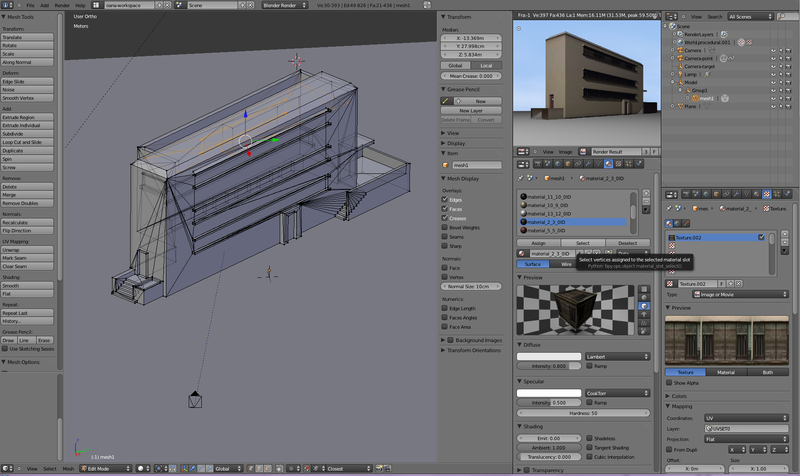 I don’t use sketchup because I can model in Blender and I would much rather do it this way. I’m the “one software for all” person. I modelled in cad for a long time but gave that up when I discovered I can do it better in Blender. Still I am a Google fan and love Google Earth so finding an architectural gem from Bucharest’s past in the 3d warehouse got my attention. I knew you can import from sketchup but now I took a closer look. You can import as a dae (collada) format and it imports just perfect, textures and all and scaled in meters, just the way I like it. This model imported as one single mesh with multiple materials. To select parts of the model I could use select from material in edit mode. If you download .kmz it’s basically the same, I found out that kmz is just a zip file. If you change the file’s extension to .zip you can open it like any zip file and you’ll find the textures and .dae file inside. I found this useful for reference as I couldn’t find enough photos. Of course I’m building it from scratch as I need a bit more detail and I want to make my own model – but I’d like to say the warehouse model is nicely detailed for it’s purpose. It could also be interesting for someone starting with Blender and needing some simple model to practice on, as it is so simple to import them. Another even more interesting use: I modeled for a competition for a hotel in Mexico some time ago and had to correctly insert the render into a photograph I received. Flying to Mexico was not on the project to do list but using the fully modelled Google version of the public plaza helped me get an accurate enough result. I wonder if you could use buildings from the warehouse in commercial projects to populate a project’s background. The terms and conditions seemed to indicate you can but I would look twice, maybe writing to them for clarification, before doing it. edit: just noticed not all models in the 3d warehouse are available for download!